When our response to pain moves in harmful direction, we must permit truth to steer us toward safety. Even when our hearts want to reject the truth, we need to remember that a heart of love is behind all truth, longing to take us to our desired haven. I am so thankful God guided me into the mental health field. Yes, I hear of pain and suffering every day. I also hear and see the results of a person turning over the pain and suffering to God. Sometimes this simple act of faith and trust take years to come to pass. A lady came for an appointment yesterday who has been seeing the doctor for at least a couple of years. Probably in her sixties, she looked like a new woman. She had such a beautiful glow on her face. Yes, the doctor prescribes mental health medications and they can be very effective and helpful. They are not the total answer to a person's problems. Medications of this nature can help, but they can also be very dangerous. I take my job very seriously, and at the same time, I understand that I don't own others problems. God put me in this position for a reason that was unclear to me in the beginning. Now I understand. God gave me a voice to encourage others and to help bring others closer to Him. I work in a mission field every day and it is priceless when a patient and I experience God's presence, as was the case yesterday. This lady and I worshipped the Lord as she shared with me how she has finally let go of the past. She was able to heal when she stopped picking at her past like a wound that had partially healed. You get the idea, right. A wound will heal faster when properly cleaned and medicated. When picking at the wound becomes an obsession, it can go from bad to worse very quickly. She picked at this wound for twenty years. Previously, she was bent over in self pity and had a long history of living in the past, filled with regrets and disappointments. She had struggled spiritually, emotionally, physically and relationally. It was a joy to see her and hear of her healing. She has reached her desired haven, and now, she is able to share what she has learned with others and to encourage them. Does this lady's story sound familiar? If so, share today's message with one who is still picking at the past and needs to stop. At some point in time, self pity and picking became normal. Encourage that person to create a new normal, one that is healthy and full of all God has planned, full of hope and peace. Speaking the truth in love, help that one reach his or her desired haven. As we carry each other's burdens, God is glorified. You did not choose me, but I chose you and appointed you to go and bear fruit - fruit that will last. Then the Father will give you whatever you ask in my name. This is my command: Love each other. I haven't given up on Nan's Calendar. I haven't had writer's block, either. I can't tell you exactly why I haven't written lately, because I don't know the answer, only that God has been directing my energies elsewhere of late. Allen, John and I recently visited with Paul and Sharon Lowry as she goes through this time with a brain tumor. They are a tremendous witness for the Lord during this most difficult time in their lives. The Lord has continued to give them strength that goes beyond words to express. My heart goes out to them. Rather than go into much detail here, please keep them lifted in your prayers. They covet your prayers and support. As well, I have devoted much time and attention to my patients and their prayer needs, especially in the past several weeks. There are also numerous other prayer needs that have been brought to my attention....too numerous to mention individually. Please pray for me, also. We are heavily into the planning and preparation process for John's upcoming Eagle Scout Court of Honor program and reception following the pinning ceremony. It will be held on Aug. 21st at 7pm. We are honored to be a part of this wonderful Boy Scout Troop 348. Paul Lowry and his brothers Fred and Scott have been such positive influences for John and the other boys in the troop. Their current scoutmaster, Dr. Hunter, is doing a great job. I can't speak highly enough of the Boy Scouting program. It takes a good boy and makes him a good man. I know it must sound as though I'm rambling. I say all these things to get to this point. God chose me to write these messages as I have faithfully for almost three years (Aug. 1st is three years). I hope I have served Him and you well in this capacity. Paul and Sharon were chosen to witness for the Lord in ways they never thought possible. They have taken this cancer and turned a negative into a positve in they way they live their lives and support each other. Their family, friends, church family, scout troop, community are privileged to know them. 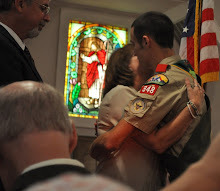 John was chosen by God long before he became a boy scout to become an Eagle Scout. It wasn't easy to climb the Eagle Trail, but he endured and continued the journey, in part, thanks to these fine men I mentioned earlier and their dedication to be positive role models. I would be remiss if I didn't mention the support from Allen and his Dad (John's dad and grandpa). God chooses each one of us for a special purpose. We only need ask Him to reveal it to us. The going is rough at times and may include many tears, but the outcome is beyond our imagination. God already knows and we only need to trust Him and obey when He calls upon us. Love overcomes fear. The last time I wrote to you was July 2nd. I haven't been idle since then. I have been in deep contemplation. I was profoundly touched by the comment sent to me in response to the message of July 2nd. You will read the comment below. Thank you so much, Anonymous, for taking time to share your honest thoughts and feelings. I appreciate it more than you know. I believe that Anonymous, in fact, does truly love God. This is evident to me in the statement itself. I have read this comment over and over again. It reminds me of how I interpret a particular verse in the Bible as I read it over and over again. I find it new and more meaningful each time I read it. Glory bumps spring to attention on my arms and my heart is filled. You may ask, "what does all this have to do with today's title?" The Breath of God is as real as God Himself. We must be still and quiet as we anticipate the presence and nearness of God. We can't see love, but we believe in it. We can't see the wind, but we know the feel of it on our skin. We can't see God, but we know He exists. We can't comprehend the depth of God's love for us or the depth of our love for God, but we know He loves us and we know that we love Him. We must relinquish the so called demands of daily life and surrender our lives to our Creator and His will. It is when we surrender that we have the victory. We hear so much about "don't quit; never give up", but we tend to forget the most important thing of all is to surrender everything to Him. We are to surrender every fiber of our being to God in order to be used for His purposes; His righteous purposes. Yes, it may be necessary to surrender numerous times each day. We are strengthened when we allow God control of every aspect of our lives. When we truly step beyond self and the ego, our Spirit rises and connects with God on that awesome spiritual plane. Sometimes, we hold back, thinking, " I can surrender everything but my finances. I won't have enough money if I......." You get the picture, right. Truly, the heart of worship is surrender. I have specific prayer requests tonight. Please continue to lift up Sharon and Paul Lowry as Sharon continues in treatment of a brain tumor. Please pray for Jodie and her family in California. She is in the final stages of cancer, as in recent days, hospice has been called to provide services for her. 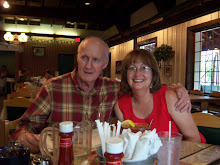 Please remember my pastor, Mike and his wife, Debbie as they and the doctors try to unravel the mysteries of illness that seems to have no end in sight. Pray for our nation and our world. We are all neighbors. Pray for those who are sad, sick and suffering. Pray for those who don't know the Lord. Plant seeds of hope and allow God the time necessary to see to it that those seeds germinate in fertile soul. I don't think I know how to TRULY love God, but I can be obedient, trying to serve Him with the light I am given through Bible study and prayer. He knows my heart and life better than I do, I think. I have an attitude of gratitude and do what I can where I am with what I have. I pray that others may see Christ in me and want that, too. Many years ago, I didn't see an image in my mind of God smiling at me. I can't explain it, but I understand it. The most important relationship we will ever have is our relationship with Christ. We are to love him with all our heart, and with all our soul, and with all our mind and with all our strength. When we love God more than anyone or anything else in the world, he knows it. He also knows it when we place anyone or anything else above him. Completely trusting God in all things brings a smile to his face. Absolute trust is vital in this special relationship. Loving God completely and trusting him in all circumstances are ways of worshipping him. Obeying God's commandments with a happy heart pleases him. Partial obedience is not enough. We all know how the heart swells when we are praised for something we've done. Just imagine the smile on his heavenly face when we praise him. We find joy in our own hearts when we bring joy to the Lord. Obedience and praise are acts of worship. The best thing I can do for the Lord each day is to be the best me I can be. I know I have been given talents and gifts and it is my pleasure, my duty, my honor to share them with others. I've heard "there's no such thing as try, you either do something or you don't do it." There are specific things God designed us to do. He created man and woman to love each other and be each other's helper and to raise families. We please God when we do the things he designed us to do. Whether we are working, playing, resting, singing, you name it, God knows every detail of our lives. Even when we're asleep, God is watching over us and smiling upon us, because he loves us that much. He is pleased when we use the talents, gifts and abilities he has freely given us. God smiles as he sees our spiritual growth and development shaping us and moulding us into the children of God we are becoming. I've heard it said "what we are is God's gift to us. What we become is our gift to God." God directs and God provides. Go with God. I am a natural born picker. I have always loved to get my hands on anything that is ripe for the picking, whether it is cucumbers, beans, berries; you name it! God is pleased when I'm out there partaking of the natural produce He has abundantly provided. Yes, berry picking is an act of worship. In fact, preparing some delectable treat with the berries is a secondary pleasure for me. I am happy to gather the crop and give the bounty to anyone who needs it or wants it. I simply love to gather fruit and produce. God freely provides us with this bountiful crop and I am pleasing (worshipping) God as I gather it in my bucket. It's not about me, really. It's about God. As I offer my time, energy and effort to pick berries, etc, I am fully in the moment. All worries or negativity leaves me. Sure, my fingers get pricked from the thorns in the blackberry thicket, but I don't consider that to be a deterent. I pick those berries with passion and commitment. I walk round and round that thicket trying to make sure I don't miss any ripe berries. Passion and commitment.....that is what true worship is about. I didn't set the plants in the ground. God saw to it that the plants came up out of the ground and became fruitful. I am thankful for the opportunity to commune with God and nature and be a part of something very special. Yes, berry picking is special. I dedicate my berry picking to God and I am aware of His presence as I pluck the ripe, juicy berries. Anything we do, whether it is a mundane chore or difficult task, is an act of worship when we do it for the glory of God and are keenly aware of His presence at the time. In fact, the mundane aspect of the chore disappears when we turn our perspective toward God. It is a privilege to be alive. It is a privilege to have work to do. It is a blessing that we are able to perform any task, large or small. Sometimes we misunderstand and misuse the word worship. Worshipping is not for us. It is for God. There are far too many facets of worship to cover in this message. The bottom line is this: whatever you do, do it in spirit and truth, and do it all for the glory of God. Do something today that brings a smile to God. Trust me, you will sense the glow on God's face when you do!